This mass flow controller/meter driven by a 24 VDC power supply has been developed as a successor to the MODEL8300. The view point change function of the display unit and the pattern setting function are unique to this model, and noise resistance has been improved dramatically. A sister model with a detachable display and setting unit is also available. 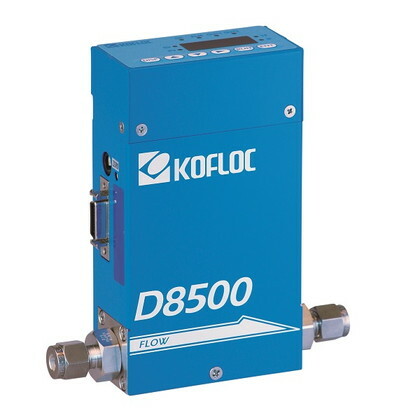 ・The high-lift actuator allows this compact model to control a large flow rate. ・Equipped with a display and setting unit, this model can be op-erated by a 24 VDC power supply. ・ The RS232C/RS485 communication function and integration function are provided as standard equipment. ・ The 14-bit converter permits display and operation in 4-1/2 dig-its. ・ Control of the flow rate of inflammable gas is possible, because the heat generating part of the sensor is not exposed to gas. ・ There are no limitations on the mounting position that may be employed. ・ In addition to SV setting, five other patterns can be set. ・ Auto zero and auto close functions are also standard.